When you don't have hot water your elements may be at fault. Electric water heater element testing is one way to determine if one or both of them are bad. For a typical electric water heater you have four items that may have failed. Any one of them can cause you to have less hot water or no hot water. The first thing to check is the elements themselves. There are two simple tests that can tell you if they are bad. See the articles, 'Testing Water Heater Elements for Continuity' and 'Testing Water Heater Elements for Ground'. The other common item is the thermostats. There are two of them, see the article 'Testing Electric Water Heater Thermostats' for a discussion and instructions on checking them. Most electric hot water heaters have two elements. One or both of them could go bad. In addition there is a thermostat for each one. If the thermostats go bad the elements won't heat up. Is this something you can do? The answer is probably yes. A couple of testers and a few precautions and you are all set. The upper heating element and thermostat controls the lower heating element and thermostat (Most of the time). When the upper element or thermostat goes bad you will not have any hot water at all. Not enough hot water could be a sign of a bad lower element or thermostat. There are a couple of simple test that you can perform to find out where the problem is. An element tester or multi meter and a voltage tester are all that you need. New elements are around $10 to $20 each. A serviceman will likely change them if he comes out. The bill will be $225 to $275. About two hundred of that will be for the installation. Finding out what you need first is a good idea. Water heater element testing is not that hard, you just need a few testers. Check the circuit breaker first. Make sure the it has not tripped. Each thermostat has a reset button (Well, not always, the lower one may not have one). You have to remove the covers and shut the power off to reset them. Only perform water heater element testing when the power is off. Electric hot water heaters have powerful current in them. You can be seriously hurt or even killed from a shock. Make sure the power is off. In addition, the current can ruin the testers. Checking for water heater power is a must on an electric hot water heater. Unlike a gas hot water heater, an electric unit will not work when the power is off. The first obvious thing you want to check is the breaker. The electric water heater should be on a dedicated two pole circuit in your breaker box. See if it has tripped. No power, no hot water. 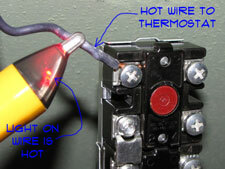 If the breaker has not tripped you will want to see if you have power at the hot water heater. Shut the breaker off for the hot water heater. Remove the covers for the upper element and thermostat. Remove the insulation and protective cover. The two hot wires should be at the top of the thermostat. Turn the power back on and carefully use a non contact tester to check for power. Make sure the tester is working on something that you know is working. Do you have power? Then it is time to check the elements. 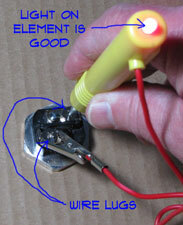 The only way to tell if a heating element is bad is to test it. The article, 'Testing Water Heater Elements' covers this subject and you can review it by following this link. A grounded element will not work, even if the element itself is good. To find out if the element is grounded in the article 'Checking for Grounded Heating Elements'. The thermostats control the elements and the upper thermostat also controls the lower one. This article on 'Testing Water Heater Thermostats' gave you the information you need.